Might as well have one place for it. The PM promised to push for the "freest possible trade" with European countries and warned the EU that to try to "punish" the UK would be "an act of calamitous self-harm". She also said Parliament would vote on the final deal that is agreed. Two of Europe's biggest banks warned on Wednesday that they could each move about 1,000 jobs out of London as they prepare for expected disruption caused by Britain's exit from the European Union. UBS Chairman Axel Weber said that about 1,000 of the Swiss bank's 5,000 employees in London could be affected by Brexit, while HSBC Chief Executive Stuart Gulliver said his bank will relocate staff responsible for generating around a fifth of its UK-based trading revenue to Paris. Germany's Handelsblatt newspaper also reported that Goldman Sachs is considering halving its London workforce to 3,000 and moving key operations to New York and continental Europe, particularly Frankfurt, where it could move up to 1,000 staff. Tourism and exports have gone through the roof because of the weaker £ - bit of a silver lining. The predicted unemployment hike with the loss of 500 000 jobs over the next two years, post-Brexit vote, has been stifled somewhat by an additional 50 000 new posts, according to some reports. Of course, we haven't officially left yet, but it's not all doom and gloom at the moment. We are well positioned, as much as the remoaners despise that fact. Britain should exit hard and fast even if it's a crappy deal, as the EUrocraps now threaten. After quick new trade deals with USA, Canada, Australia, half the Commonwealth, and Japan they'll be in a better position than now. Call the EUrobluff - within two years of Brexit the European bluster will evaporate and they'll beg the UK to join the free trade zone. Really not liking this. Means I need to guess where this is going for next career jump. Could do without that uncertainty. Pretty colouring in, but completely wrong. 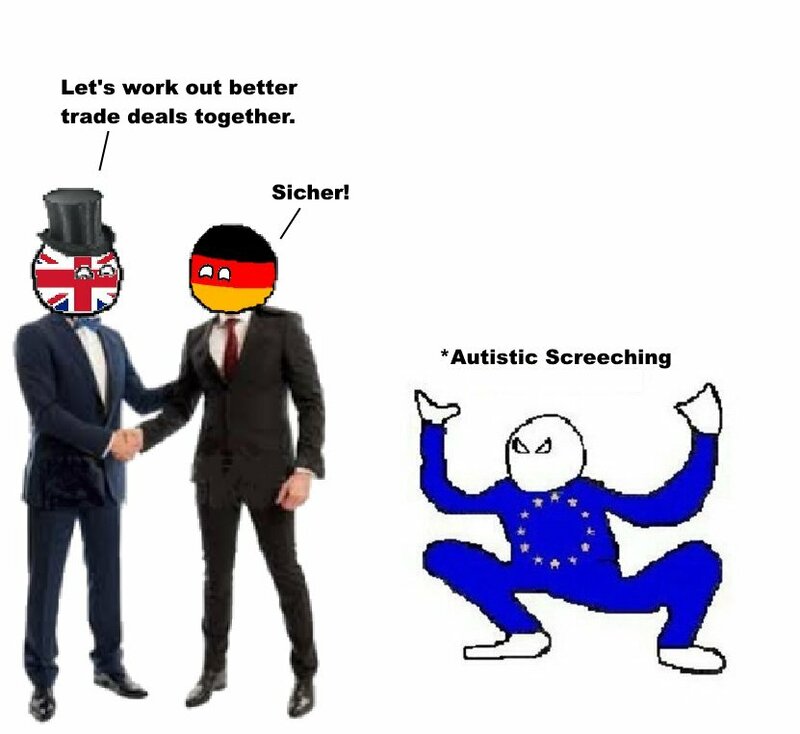 Germany can't negotiate its own deals outside the EU structure, any trade deal has to be negotiated by the EU and then ratified by all 28 members (27 after Brexit) and that agreed trade agreement is what all EU countries have to abide by. One of the many hazards of being in the EU. It's like trying to herd cats. That said, Germany obviously wields a lot more power than most of those members, and everyone knows it. That is a reality, it doesn't matter if it's not supposed to be like that. I would say they have additional influence, they might be able to exert power on debtor countries like Greece but could be hamstrung by smaller countries like Malta who are outside the financial influence sphere and can throw spanners into the works of trade agreements if they decide to be obstructive. France can also be spectacularly obstructive to anybody and everybody if they think it will advantage them. Yeah, actually there were lots of people talking about that. The remain camp never shut up about it, so it's not like we didn't know that was a possibility. The EU was also constantly telling us that the single market requires everything else we wanted to get rid of. We'll see. We have other trump cards to play if they want to be difficult. Free trade is access to the single market though. Free movement and legislation are deal beakers. The UK gov is not in a position to negotiate those obviously, because those are what we voted for. And if we were to accept them, it would be like being a member without a voice, which is even worse than what we previously had. Which is ironically what Hannan favours, although he won't say it too loudly. 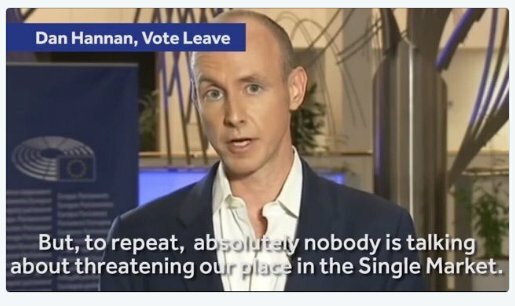 Hannan wants access to the single market while having the ability to sign trade agreements with the rest of the world. I don't think he cares about the minor details of that access. FTA would suit him fine. He seems very determined to swing our trade to high growth regions anyway. Probably more determined than he is to have access to the single market, although everyone wants to have their cake and eat it too. He will be wanting both. Poland estimates it will attract 25.000-30.000 new jobs from Britain this year in the sector of advanced business services, Deputy Prime Minister Mateusz Morawiecki said on Monday. "Some time ago Poles were departing to London, but now it is the other way round - we estimate that we will attract from the British islands 25,000-30,000 new jobs in the sector of advanced services for business this year," he told news conference. Analysts from three City of London financial institutions expect the cost of Theresa May's hard Brexit to add up to between 5 per cent and 10 per cent of GDP by 2030. In today's money that's equivalent to between £100bn and £200bn. This is an estimate of the loss of GDP relative to where the economy would have been without Brexit. while I think Brexit is overall a stupid idea, the notion that Eastern European workers are going to be replaced with Indian or African migrants is even more stupid. Firstly, there isn't going to be unrestricted immigration allowed from India or Africa and secondly, the low end of the job market is legislated and the minimum wage would prevent employers from offering this "substantially lower pay". Theresa May wants to explore how to boost US-UK migration when she meets the US president, Donald Trump, this week as part of their talks over an early trade deal, according to British government sources. The disclosure follows hard on the heels of the confirmation from the Australian high commissioner in London that exploratory talks have already begun on a UK-Australian free trade deal, and that greater access for Australian businesspeople to Britain will have to form part of it. This approach – linking any future expansion of highly skilled migration to successful trade deals with America and Australia – contrasts sharply with May’s blunt refusal during her visit to India last November to increase the number of UK visas for highly skilled Indians, despite its potential to boost the prospects of a future trade deal. May has yet to make clear how she sees non-European immigration policy developing after Brexit. When she became prime minister in July she rejected the leave campaign’s demands for an “Australian-style points-based system”, saying it would leave Britain without full control over who enters the UK. Going to be interesting to see how both countries approach this. will the guys that have been living off unemployment subsidy actually go find work and do it. i knew of some who didnt want to work, they just get their few pounds per week and that was it. they will need to shake that culture. The "dole" existed before the EU, it's unlikely to change just because the UK and EU are splitting. Don't believe everything you read in the UK tabloids, living on unemployment benefits is no picnic and it's a very small percentage of people want to remain on them. Latest figures I found out the number of people on unemployment benefit at around 770k with 31.05 million in work (2015 figures).